Malcolm is back to work the last couple of days. Val has been helping David get packed up and ready to fly home tomorrow. They set out the empty LP tank from the trailer today and the staff picked it up and filled it, putting it on our bill. They dropped the full tank off next to the LP compartment on the trailer and David hooked it back up later. Our parts (roof to rear wall transition trim) arrived from Heartland today at the office. We picked them up on our way to the park-sponsored Taco dinner. 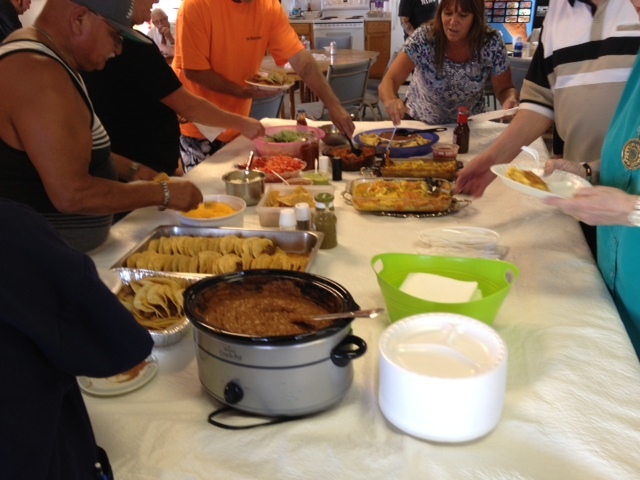 The park provided tacos and fixings, while others pitched in side dishes or desserts. Val baked a batch of gingerbread cookies to take. They were gone by the time we left. 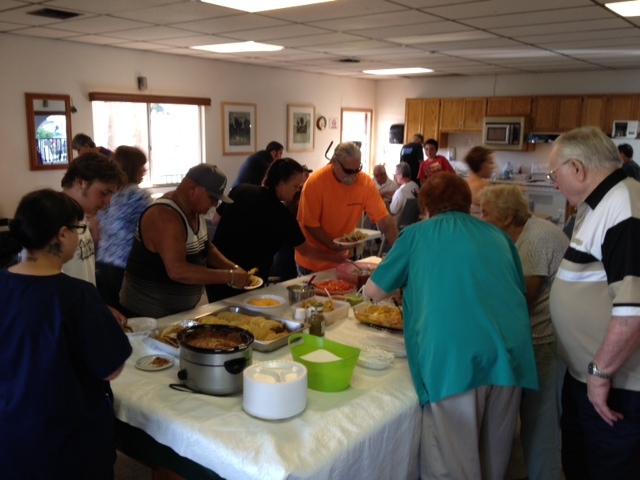 There was a pretty good crowd there for the dinner. 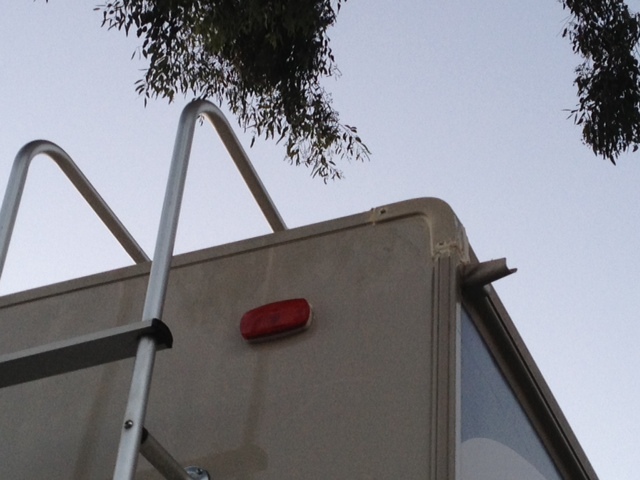 After the dinner, Malcolm and David removed the old trim piece on the corner of the trailer and installed the new one. Though Heartland sent proper color silicone sealant, Malcolm couldn’t find the tip that screws on the sealant tube, so he used the almond colored general silicone sealant he had left over from the hot water heater repair. It’s close enough that he’s not worried about the look. Heartland did provide a tube of Dicor self-leveling sealant for the top part and Malcolm used that. He used some of it to make sure the kitchen fan was fully sealed, as the factory sealant looked a little cracked in spots. 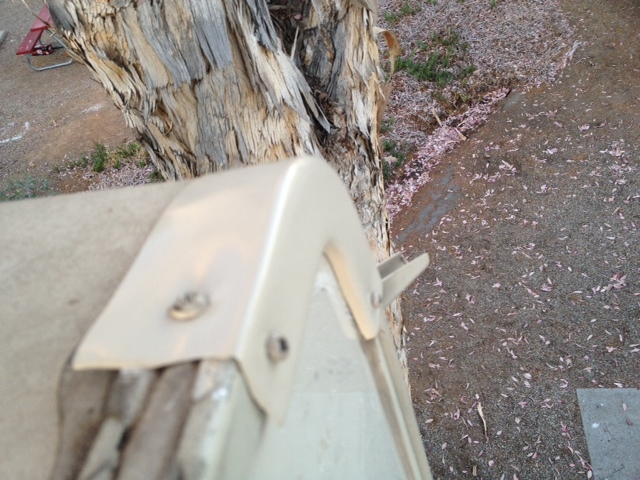 New piece installed and screwed on. Tomorrow, Val will take David to the San Diego airport to fly home. We’ve enjoyed having him around and will be sad to see him go, but his roommate is leaving for school the end of this week, so David will be back in charge of keeping up the house and feeding the cat. 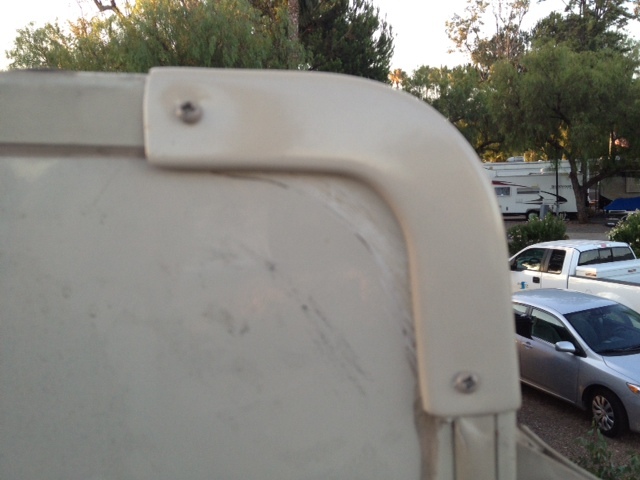 This entry was posted in California, Trailer Maintenance, Working. Bookmark the permalink.